Our free simple bookkeeping spreadsheet records receipts and payments for up to 100 transactions and produces a summary of receipts and payments at the end of the accounting period. Keeping bookkeeping records is a necessity for any small business. It is crucial to keep records in good order and prepare financial information on time and in an easily understood format. Start your bookkeeping today by downloading our FREE simple bookkeeping spreadsheet in Excel format by subscribing to our mailing list using the quick form below. More features are available in our unlocked premium version available below. Delete the example name, period, and transactions. Switch to the bookkeeping spreadsheet tab, and highlight the completed example cells (Row 7 onwards) and delete the contents. Do not include any cells in column N when trying to delete as this column contains protected cells. Enter the business name and accounting period. The accounting period would normally be one month, but can be any period appropriate to the business. Enter the expense payments categories. There are nine expense payments categories, phone, mobile etc. You can rename these categories by highlighting the cell and entering the new name. Enter transactions. For each transaction enter the date, reference, description, and amount under the appropriate column heading. The simple bookkeeping spreadsheet will total the expense payments for a particular transaction and also provide totals for each category for the accounting period. Switch to the accounts summary tab. The accounts summary tab will show a summary of the receipts and payments for the period together with a net receipts total. The simple bookkeeping spreadsheet premium version is a spreadsheet like the free version but includes a few other features that make it more powerful as summarized in the table shown below. The unlocked premium version does not use password protected sheets, so you have access to all Excel features. A licence to use the Premium Version costs £5.00, and can be purchased using the Buy Now Paypal link below. We designed the premium version of the spreadsheet using Excel 2010. Please check compatibility with your version of Excel before purchasing. If you are in any doubt please test compatibility by downloading and trialing a copy of the free version of the spreadsheet also developed using Excel 2010. The Buy Now button will take you to the PayPal website to complete your purchase. If you do not have a PayPal account you will have an option to pay by debit or credit card. Your purchase will appear on your account under the heading “DP DOWNLOADS”. After you’ve completed your payment, PayPal will return you to our website downloads page, where you can retrieve your file. What Happens if there are Problems Downloading? Don’t worry, if you have any problems downloading the file simply contact us with your name and payment reference, and we will email you a link to the file. Users use this Excel accounting spreadsheet at their own risk. We make no warranty or representation as to its accuracy and we are covered by our Terms and Conditions, which you are deemed to have read. 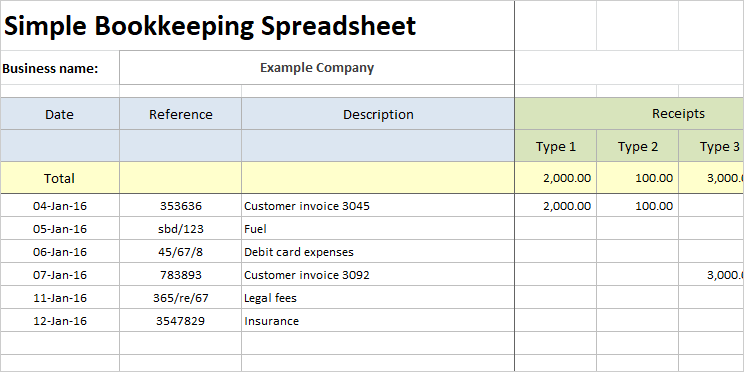 This is an example of a free bookkeeping spreadsheet template that you might use to record accounting transactions. It is purely illustrative of small business bookkeeping software. This is not intended to reflect general standards or targets for any particular company or sector. If you do spot a mistake in the simple accounting spreadsheet, please let us know and we will try to fix it.